Home > Shop By Brand > Pinnacle Natural Brilliance > Pinnacle Bodywork Shampoo 128 oz. 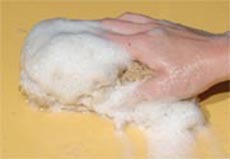 Pinnacle Bodywork Shampoo now contains TUFF SUDS II. This new foaming technology uses cleaners suspended in the bubble’s walls to scour away the toughest road grime. For all its cleaning punch, Bodywork Shampoo is amazingly surface-friendly! When mixed with water, it yields a perfect pH-neutral rating of 7. It absolutely will not remove protective wax or polymer surface protectants. This is what we refer to as a high-yield shampoo. The concentrated formula creates 3-4 gallons of wash water per ounce of shampoo. This eliminates the need to refill the bucket halfway through the wash. Automotive paints, particularly clear coats, are not made to be static and lifeless. They are designed to dance under the light, shimmering at every angle. 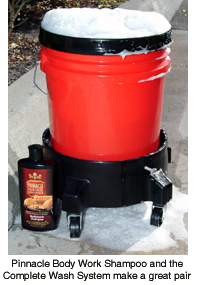 Pinnacle Bodywork Shampoo is the first step in restoring the personality to your paint. 1. Pour 1-2 oz. of shampoo into a clean bucket. It will be helpful to use a 5 gallon bucket to get the proper dilution ratio. The Complete Wash System with Dolly will come in handy for this purpose. 6. 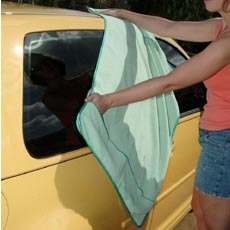 Always towel dry your vehicle following a wash to prevent water spots. Use a clean, soft Cobra Supreme Guzzler Microfiber Waffle Weave Towel that is designated just for drying. Dry windows first and then concentrate on body panels. It may be helpful to go back with another towel to catch water that has accumulated around mirrors or emblems. 8. Always apply wax if there is none left on the paint. Pinnacle Souveran™ or Signature Series II will offer excellent protection and a dazzling shine. If necessary, pre-clean with Pinnacle Paintwork Cleansing Lotion. We suggest these money saving kits that contain Bodywork Shampoo. Each kit is thoughtfully assembled by our expert car care professionals. Purchasing in kit form insures you have all the products and tools needed to successfully accomplish your goal. Tons of Suds, Mild On Your Beautiful Finish! I've been using various high end car wash products for years. This is as good as any I've tried and will be my go to from now on. It delivers a beautiful wash without removing wax or leaving streaks. Plus I love the long lasting suds. This has to be the BEST car shampoo I have ever used. Never ran out of thick slippery suds for the entire wash. Just 2 ounces for a 5 gallon bucket, awesome scent too. I have used more expensive car shampoos before and this blows them away, thank you Autogeek. ProsGreat scent, great cleaning , awesome lubricity. This is by far the best auto shampoo on the market. Seems to float the dirt off for effortless cleaning. I've only had one opportunity to use the shampoo so far but am very please with the cleaning power and shine it left on my vehicle's paint.